After surgery or serious injury to the feet, it's vital that adequate protection is used to guard against reaggravation or injury. 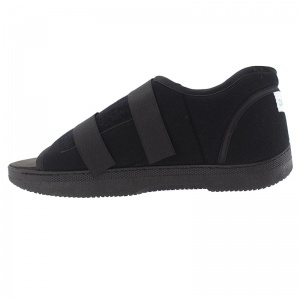 The Darco Softie Post-Operative Shoe is an economical post-operative shoe designed for soft tissue trauma or surgery. Lightweight and comfortable, this shoe is a cost-effective alternative to premium products that still provides great levels of rigidity and forefoot control. The Darco Softie's very soft, breathable upper is made of a poly-cotton blend that conforms to the bony contours of your foot. This allows you to remain comfortable and cool even after extended periods of use. A semi-rigid metatarsal shank permits enough flexibility for ambulation while providing superior control of forefoot motion to ensure that post-operative healing is not disturbed. This makes for superior protection after osteotomies. The Darco Softie Shoe is sold as a single item and is available in women's and men's sizes. Please consult the sizing chart below and select the option you require from the drop-down menu. The Darco Softie Post-Operative Shoe is usually dispatched via First Class Royal Mail and delivery should be within 1 to 3 working days. Arrived on time and very comfortable and a lifesaver as the hospital wouldn’t provide one. Will use you again in the future. Very pleased with my purchase. 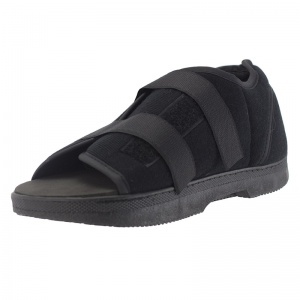 Sandal very good, does job perfectly especially as I needed to attend medical soon after operation. Service was excellent. I had a query that was answered very quickly and the company rep was very helpful, pleasant and professional. Sandal arrived the next day. Overall very very happy and would recommend. Thanks a lot for your feedback -- we're glad that you had a good experience with us and hope you will keep us in mind for your future needs!